Craft Buff: Who Can Resist a Glow-in-the-Dark Beast Cross Stitch Kit? Who Can Resist a Glow-in-the-Dark Beast Cross Stitch Kit? Illustrator and typographic comic artist Ray Fenwick has designed a new glow-in-the-dark cross stitch kit for Subversive Cross Stitch. Coveting it made me remember my own adventure into the world of subversive cross stitch a while back... voila! 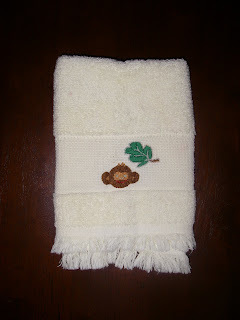 I present to you "Monkey and Huge Leaf Hand Towel." Wow, I am still impressed by all the stuff you find time to make. And I'm being educated. For some reason I always thought cross stitch was only the kind where you make the Xs- like the samplers colonial women made with the alphabet and stuff. That's what I should have brought here- I even have an embroidery hoop that I got for your quilt piece. Bad planning. Can I send you a kit? E-mail me your mailing address and I'll give it a whirl. Nice work, u r talented.